If retail is a proverbial glue factory, it's no secret that department stores are currently its sickest-looking horses. Debenhams is under siege from Sports Direct owner Mike Ashley, on the warpath with the scalp of House of Fraser already in his hand, while John Lewis & Partners has just announced a 45% fall in pre-tax profit. 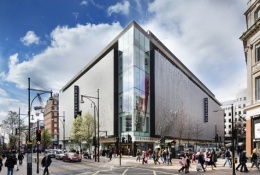 For department stores lagging behind in developing their online sales (Debenhams and House of Fraser), the shift to e-commerce is one of the most important, but with John Lewis also suffering despite having a large online presence, it is clear that wider factors are at play. Both Debenhams and John Lewis depend on more affluent, younger families (more under-50s than over-50s) for a large share of their customer base. 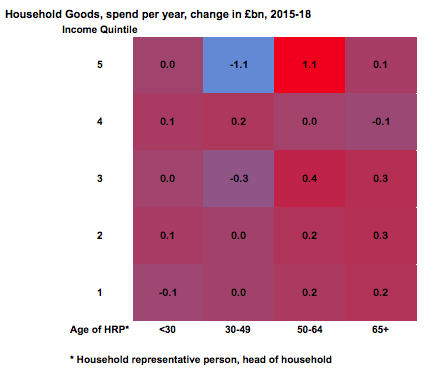 As the heat maps below show, in the last three years, top income quintile (those in the top 20% in terms of gross income) households headed by 30-49s, which are at the core of their markets, have actually cut their spending in two areas that are both key to these retailers: fashion and household goods. These show up as blue in the heat maps. 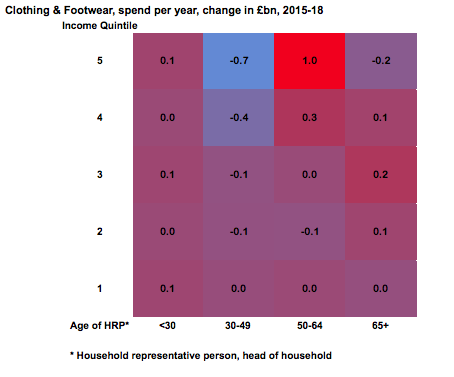 Meanwhile, the smaller, wealthy 50-64 group, favoured by demographics (the UK's sixties baby boom) and economics (these are mostly owner occupiers with smaller or no mortgages) is seeing its spending boom. It is the wealthy 30-49s above all that have been hit by the infamous 'Brexit jitters', probably since they are most exposed to any negative consequences, with either large mortgages, if they are lucky, or a precarious existence in private rented housing, which is increasingly the case. So, for once, it is not the millennials who aren't "killing" anything here, but their older counterparts, Generation X. Unless these department stores refocus with the right fashion and home ranges, services and in-store experiences like restaurants and bars to target the more mature, older family audience, many with adult kids at home, they are going to carry on losing sales and heading for oblivion. ConsumerCast offers reports and briefings on this and other consumer and retail topics. Please get in touch to find out more.